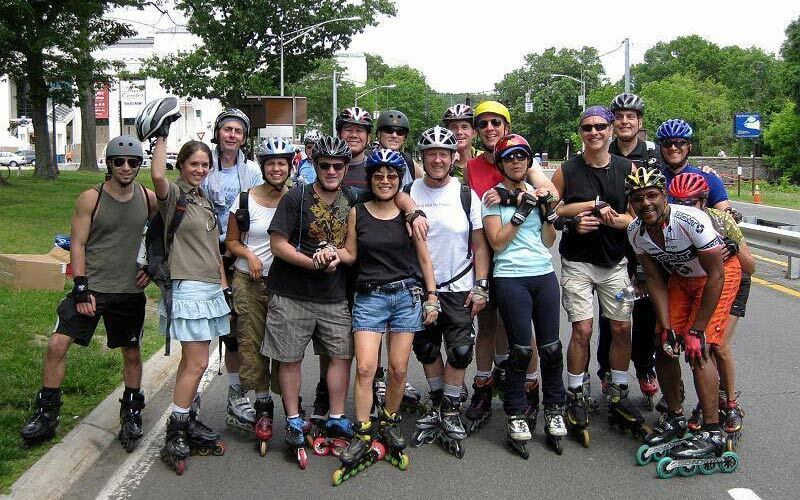 On most weekends, and occasionally twice per weekend, from spring through autumn, the Empire Skate Club organizes group skates that explore the city. We may also skate in winter when the weather is fine. Upcoming event information is available on our calendar — late and last-minute updates are usually posted on our Facebook page. The pace and distance of our weekend skates vary. Most tours are moderately paced skates of somewhere from 12 to 20 miles and may involve a restaurant stop. A few are longer and more intense. Weekend afternoon, half-day, or day skates most often start out from Central Park, either from Grand Army Plaza (map), Columbus Circle (map), or the Bandshell (map). Terrain is usually suitable for intermediate skaters, but some events may require more advanced skills. Almost all routes require that skaters be accustomed to skating alongside traffic, but we do organize a few events per year on roads (temporarily) closed to traffic. Popular city destinations include Battery Park, the Cloisters, Randalls/Wards Island, Yankee Stadium, the Unisphere at Flushing Meadows/Corona Park, Coney Island, Sheepshead Bay, and Far Rockaway. We also do occasional skates in Westchester County and on Long Island, and may organize a skate or two per year up route 9W to Nyack. 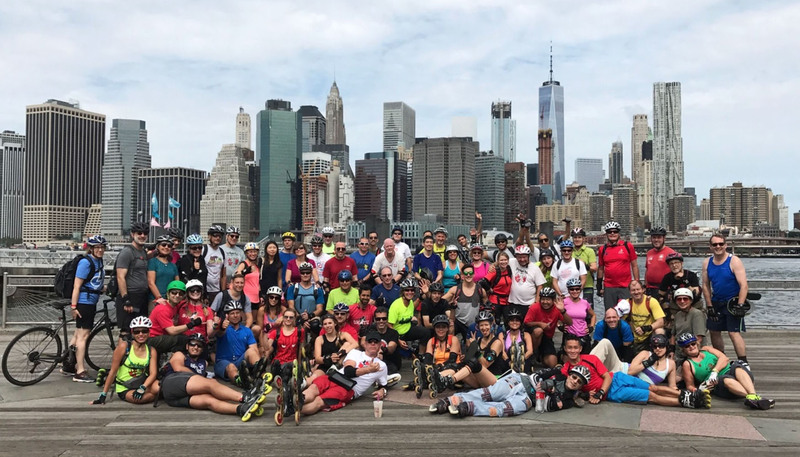 Some Weekend Skates have become annual traditions, including the Bronx River Parkway Summer Sunday skates, the Grape Es-Skate on Long Island, and the long-distance Halloween Sleepy Hollow Skate. Routes from Central Park to outlying locations such as Rockaway are usually designed as one-way skates, with return to Manhattan by subway or train. However, it is not unknown for some of our more extreme members to double the mileage by skating back. If our weekend group skates sound too intense for you, or not intense enough, consider volunteering to lead a skate. Announcements of weekend group skate meeting times and destinations will be made on the calendar and on the Empire Facebook page. Any late updates due to inclement weather or other issue will also be posted on the Facebook page. The Empire Skate Club's premier event each year is the Big Apple Roll (BAR), a four-day extravaganza of group skates, social events, and adventures exploring and experiencing New York City on skates. 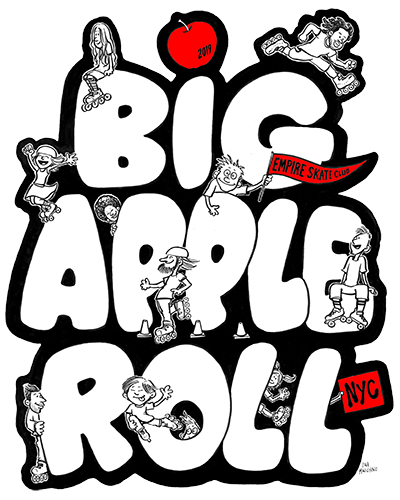 The 17th annual Big Apple Roll is scheduled for August 1-4, 2019.